Behold! Less than two months. Hope it is mastered nicely. Awesome album. It must be re-released on vinyl, would make for a beautiful LP. no lp or vinyl avaiable for this release? . .
An all-time classic of electronic music. It contains of course the famous "Freestyler", but personally I prefer songs like "Other Emcees", "Sky's The Limit" and "In Stereo". The whole CD is around 45 minutes of non stopping fun, and I find this average mark a bit too low. It may not be a masterpiece, but you can only have a smile when you listen to it. 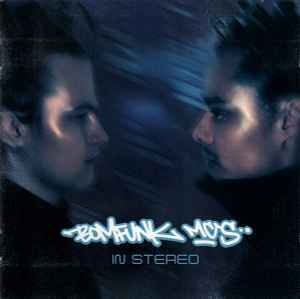 Shame that Bomfunk MC's disbanded not so long after its release. To sum up, "In Stereo" is an exotic record straight from Finland which has to be in any collection of breakbeat and/or hip-hop albums. On CD are 12 audio tracks and 2 videoclips (Freestyler, Uprocking Beats). This release has had surprising longevity for me. Like everyone else, I bought the album after getting hooked on the catchy tune 'Freestyler', which was all over the radio and television at the time. The rest of the album follows in similar fashion, with big bass lines, in-your-face vocals and breaks influenced percussion. While this isn't an album I'm proud to own or one that I'd defend as actually being any good, I can definitely say that I enjoy it. When I'm sick of serious music that requires proper attention, this is a very nice distraction which you can sing along to and nod your head. All the tracks are fun. It's one of those albums that everyone seems to like too: it's like a far inferior version of The Prodigy, Fatboy Slim or The Chemical Brothers - a mish-mash of sounds and ideas which have a real party feel. Yes, I would recommend this CD, but only if you can pick it up cheap and don't expect much.